Although this is a study of a bloodfeud between two Northern families I'd recommend it as an introduction to late Anglo-Saxon England, or even to the family politics of early medieval Europe. Because of the paucity of the source material Fletcher has to explore the social and political context thoroughly, but at the same time the rivalry of the two families, with outbreaks of extreme violence, acts as a ribbon of plot that runs through the book. The nature of the evidence is sketchy enough that tender hearted readers need not fear being confronted by graphic scenes of violence, instead Fletcher has to infer the extent of the power struggle between the two noble families.For readers familiar with Anglo-Saxon England there is a lot to value in seeing that world from a Northern English perspective when the outlook of the West Saxons tends to be the default for this period of English history. 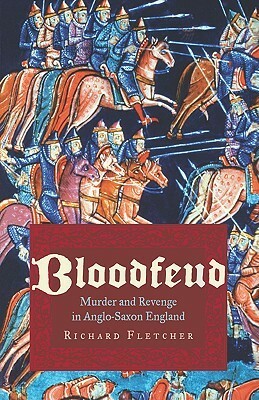 Bloodfeud is one of those reference books that you would want to read after you have a decent working knowledge of the period's history; otherwise many of the subtleties may be lost on you. If you are looking for those fine details that help to connect the dots - so to speak - this is an amazing source. Richard Fletcher, professor emeritus at the University of York, gives us a thorough exploration of the customs, habits, and motivations of this shadowy culture which the moderns of European descent don't easily relate to. For instance, "Regrettable though this might have been to high-minded churchmen, it was a fact of life that violence and conflict were as much a part of the social order as was peace." And, "Peace was not the natural order of society in the age of Uhtred and Thurbrand. It was a social condition that had to be brought about..." We are talking about 11th century Northumbria, and these specific individuals started a feud at the beginning of King Canute's reign that lasted on and off for over 60 years.As he explains it, the Bloodfeud was considered honorable - even obligatory - for generations if need be. There were certain conventions that were recognized: "Anglo-Saxon Kings did not seek to abolish feuding; that would have been almost inconceivable. Guided by their churchmen they lamented indiscriminate violence, but they accepted the sanctioned, legitimate violence involved in feuding, seeking only to enforce a proper observance of customs designed to limit its spread." Negotiators were impartial and respected parties, from friends, elders, churchmen, even kings. Sometimes a negotiated settlement worked; but it was not uncommon for a feud to resurface years or even decades later, sparked by an incautious taunt or a more villainous purpose. This book is about much more than just feuds. We see a close-up of the Anglo-Saxon culture, as well as life under different kings and earls. We see what led to turmoil between families, and we catch a whiff of contemporary viewpoints. Fletcher freely admits that much of our knowledge of this distant era has been pieced together from random bits of information: a gift of an estate to the church, a deed, a chance remark from an anonymous chronicler. But some of these tidbits speak volumes and he helps tie them together with important events. We also get a closer look at certain individuals such as Tostig Godwineson, who is not the necessarily the black-and-white villain often depicted. It's possible that his unpopularity was due as much to his outsider status as his imposition of burdensome taxes. There is evidence that Earl Morcar secretly plotted with the Northumbrian chiefs for the overthrow of this son of Godwine, the enemy of his house. Interestingly, Fletcher makes a point that I never thought about. He suggests that since Morcar failed to defend his earldom against Harald Hardraada, it is very possible that King Harold II relieved him of his office before going south to Hastings (and appointed sheriff Merleswein in his place). This could explain a few things!This volume will most definitely keep its place on my bookshelf; I'll need to refer to it again and again. What I took away from this book was a more thorough understanding of a complex society that followed harsh rules imposed by a less forgiving culture. An interesting book, but not what I was expecting. The whole problem with the Dark Age era is the lack of primary sources on which historians can base their works. On reading the blurb of this, a book solely occupied with feuding families in 10th century Northumbria, I imagined that the book would open up new nuggets of information, leading us to new ways of understanding about the way of life in those times...It sort of misses the mark, and that's because a large section of the book is padded. Over half isn't actually about 'blood feuds', but instead general historical background on the period. We learn about Anglo-Saxon politics, then more specifically the politics of the north. There's a lengthy section detailing the reservoirs of power that existed during the period, as well as various battles between the kingdoms of Bernicia and Deira against the marauding Scots. The last couple of chapters give us another re-run of the Norman Conquest.It's all fine by itself, but in the course of studying the period, I was already very familiar with all this. I wanted new theories and new ground. Admittedly, there is some, in the mid section of the book, but again the facts are very sketchy. Fletcher does a good job of linking it all together and providing focused suppositions based on his scanty information, but it's thin on the ground.In reality, this details a strung-out series of murders between heavy dollops of the background of Anglo-Saxon society. The writing style is fairly easy to cope with and the book doesn't outstay its welcome, it's just not what I was expecting. Very entertaining story of a violent feud between two Northumbrian clans that spanned generations. It also doubles as a pretty concise history of the north of England, and Anglo Saxon England as a whole, in the 11th century. The culture of feuding, the laws built around it, the ways the Church got involved and how it impacted contemporary society as a whole are all covered, painting a picture of a more sophisticated society than is usually portrayed in pre Norman Conquest England, but also a society in which brutal violence was considered the norm, and peace, law and order was something that had to be strictly imposed from above. I liked it enough to check out what other works the author had written, and it was a real bummer to discover he died in 2005. Fletcher's book is good on Anglo-Saxon England, and on the general historical background of the time, but I felt he kept drifting away from the supposed focus of the book. I was hoping for something that focused a little more clearly on the bloodfeud, rather than sticking to generalities I was already aware of. It's easy to read, and interesting stuff, but not what I was hoping for. The murder of Uhtred Earl of Northumberland serves as a fascinating jumping off point to give a vivid account of life in late Anglo-Saxon England. Documentary sources are very thin, and if you want a work of history that is full of dates and facts, this is not it. This can be frustrating at times, because just as I got deeply engaged in the personal story of one of the characters, he or she would disappear off the record. So the strength of this book is in the skillful way in which the author moves from the particular to the general to describe society and politics in this transitional age, just before the Conquest.It's a great, lively read! A rather deceptive book in that it appears to be one concerning a distinct specific period in Anglo-Saxon politics that analyses the nuances of the culture at the time but turns out to actually be a fairly staid, generic book on the Anglo-Saxons from early days to the Norman Conquest, with the bloodfeud relegated to the status of an afterthought.A good introductory book for those who are completely new to the period but one which will actually only antagonise those already with any kind of familiarity with the events or main protagonists. Great for those of you who: a) love the dirty side of medieval england; b) like lots of historical details, and are able to hold multiple early english names in your head (I can't keep my Eodreds straight from my Eothoreds; c) can devote some concentrated time to this. I am almost there, but not quite. I read it some years ago, and picked it up again for a diversion from the semester. But it defeated me this second time. I want the movie with Clive Owen and the new terminator dude. This is not only the best popular book I've ever read about Anglo-Saxon England, it maybe be the best book written for non-specialists that I've ever read about any medieval topic. The names can be jaw-crackers and confusing if you're not used to them, but this gets better if you focus and it's worth it. Recommend this highly to interested students! Read many years ago, but I remember enjoying it. There is a lot more genealogies and saints than feuding and revenge. Its an interesting examination of the general time and place, but not exactly what it promises in the title. Highly recommended read, a thoroughly in depth look at life in the Anglo Saxon age, blood feud and revenge through the generations and how this shaped the families and their lives. This is a decent overview of politics in Anglo-Saxon England. It might be a bit much for people who haven't read up on the period. If you have some knowledge of this period of history and this part of the world, it's a good read.It does wander off from the implied subject about specific feuds. Frequently, it takes a much broader look at the era. I found it to be a good bit of historical writing, and enjoyed it.Recommended for students of history and/or England. Essential reading if you want to deepen your knowledge of troubles 'oop noorth' in the 11thC. It helps if, like me, you are well read in the period and thus have the background knowledge to appreciate the politics involved. It's hard to make a blood feud dry but this was in a few places.But it also was chock a block full of details of the time. Well researched and very readable. Interesting pop-scientific retelling of the conflicts between the Anglo-Saxons and the Vikings under the reigns of Canute and Ethelred the Unread. Speed-read for my thesis.